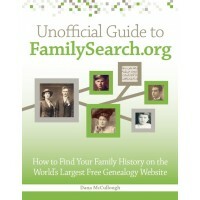 I think FamilySearch is my official favorite genealogy research website. It seems like every time I visit their site I end up staying up way past my bedtime and finding new information about my family. Last year, I was taking advantage of Ancestry.com‘s free access to immigration and passenger lists, when I came to a road block researching my mother’s side. I briefly switched to FamilySearch to see if I could find any clues there, but didn’t, so I decided to change gears to look for immigration or passenger list records for my dad’s family. The challenge with researching my dad’s side is that I didn’t really know when they came to America. It was likely long before my mom’s family did in the 1920s. I knew my great-great grandparents’ kids were born in America, but they were born in Germany. Unfortunately, I didn’t have the names or birthplaces of their parents. I had tried finding naturalization records to see if that could pinpoint their immigration year from those records, but didn’t have success. So, I plugged in the information I new about my great-great-grandfather, Frank H. Rolfes: he lived in Le Mars, Iowa, was born in 1852 and married Mary Meinen. After seeing several birth records for Frank and Mary’s children, I saw a transcription of Frank’s death record. The death record included the names of his parents (including his mother’s maiden name! ), which I previously did not know. Next, I looked at the census records that came up in my search. The 1900 U.S. census found Frank, his wife, and six kids in Iowa. Scrolling to the right, I noticed columns for the year they immigrated to America and number of years they’ve been in the United States. Guess what? The year Frank and his wife Mary immigrated to America was included: Mary in 1868 and Frank in 1870. Since Mary was born in 1866, it likely means her parents came to America, too. Unfortunately, the clock on free access to Ancestry.com’s records ran out before I could start searching Frank’s and Mary’s immigration records. I hope the free access returns soon, because now I have a much better idea what I’m looking for and my family history curiosity is growing.